Not all DLP systems are created equally, as their creator, Texas Instruments, is forever tinkering with its technology and coming up with improved chipsets. So it doesn't come as a shock that projectors vary according to their generation and specification. 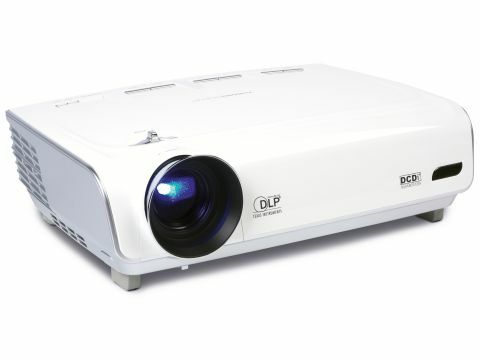 What is very surprising, however, is that Optoma has put one of TI's latest and greatest DLP chipsets, the DarkChip 3 (DC3), into the heart of a projector costing just £1,600. That's a whole £400 cheaper than the InFocus IN78 and that was several hundreds of pounds cheaper than the previous DC3 offerings. What this means, is that if the ThemeScene HD73 can rival the InFocus on quality, it could become one of the biggest AV bargains ever. The aforementioned chipset is the HD73's main claim to fame, with its potential for delivering better black levels and faster response times than previous, cheaper incarnations of DLP technology. Accordingly, the HD73 quotes a sky-high contrast ratio of 6,000:1, with the native resolution being a slightly unusual 1,280 x 768 pixels. This is unusual because it equates to a 16:10 widescreen aspect ratio rather than the standard 16:9. The HD73's video processing includes Faroudja's DCDi de-interlacing system and the TI developed BrilliantColour and TrueVivid initiatives that give more welly to colour saturation and tone. Impressively, the HD73 can handle top-notch 1080p sources as well as the more common 720p/1080i options, and it includes an Image AI feature designed to automatically adjust settings so they're always optimised for the image content being shown at any particular time. The connections panel includes two digital inputs: one HDMI and one DVI. These are backed up by the inevitable component video, S-video and composite video ports, but there's no VGA PC jack, since the DVI is expected to take on PC duties, as well as video. Day to day use of the HD73 isn't bad, thanks to some decent onscreen menus and a perfectly functional remote. However, we found the projector rather trickier to get set up well in our room than most - not least because of a rather fiddly drop-down leg/vertical image shift combination and a limiting 1.2x optical zoom. The HD73's pictures make an instant and aggressive impact, thanks to a remarkably rich and fully saturated palette. Presumably, thanks at least in part to the BrilliantColour and TrueVivid systems, the hues contribute to making the picture look exceptionally solid and arresting for a sub-£2K projector. It does no harm to the colour impact, either, that the HD73 also produces superbly deep black levels, free of all but the faintest trace of the flattening greyness that usually besmirches levels at the affordable end of the market. The HD73's hi-def performance reveals it to be a far more accomplished performer when it comes to sharpness and fine detailing than the vast majority of its affordable DLP counterparts, too, as it does a great job of reproducing all the extra textures and clarity that make HD so special. However, Optoma's attempt to make the HD73 so cheap by DarkChip3 standards has caused a problem or two. The worst of these concerns DLP's rainbow effect. Whereas the InFocus IN78 was practically immune to this, we were frequently aware while watching the HD73 of the tell-tale stripes of pure colour flitting around within our peripheral vision. The HD73 also falls prey slightly more than the IN78 to that other DLP issue of fizzing noise over horizontal motion, and leaves really rapid movement looking just a touch blurred at times. The net result of all these noise types - coupled with the fact that those vibrant colours mentioned earlier can sometimes look a little off-key tonally - is that the projector's mechanics sometimes really distract you from what you're watching. This is a rather cardinal sin in home cinema terms, and one that actually makes one or two high quality DarkChip2 or even LCD models arguably more persuasive at this sort of price level. Aside from the odd distraction, picture quality is still good for a model with this reasonable price tag and the twin digital inputs and healthy features list are plusses.